Western blot analysis of extracts from HeLa cells, transfected with 100 nM SignalSilence® Control siRNA (Unconjugated) #6568 (-) or SignalSilence® Apaf-1 siRNA I (+), using Apaf-1 (D7G4) Rabbit mAb #8723 (upper) or α-Tubulin (11H10) Rabbit mAb #2125 (lower). 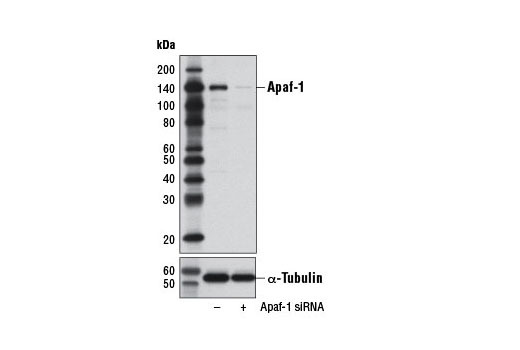 The Apaf-1 (D7G4) Rabbit mAb confirms silencing of Apaf-1 expression, while the α-Tubulin (11H10) Rabbit mAb is used as a loading control. 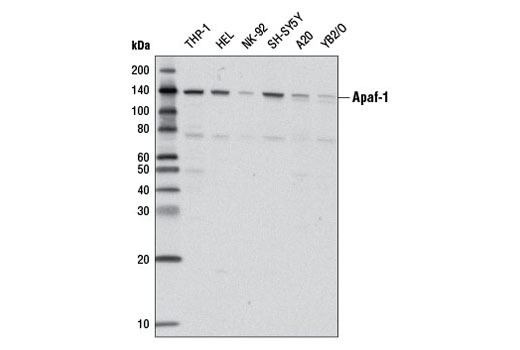 Western blot analysis of extracts from various cell lines using Apaf-1 (D7G4) Rabbit mAb. Apaf-1 (D7G4) Rabbit mAb recognizes endogenous levels of total Apaf-1 protein. Monoclonal antibody is produced by immunizing animals with a synthetic peptide corresponding to residues near the carboxy terminus of human Apaf-1 protein. Apoptotic protease activating factor 1 (Apaf-1), originally identified as the mammalian homolog of the C. elegans apoptotic regulatory protein CED-4, is an important signaling protein involved in the activation of caspase-9 during apoptosis (1). Cytosolic Apaf-1 forms a complex with caspase-9 in the presence of cytochrome c and dATP, ultimately leading to caspase-9 activation and subsequent activation of caspase-3 (2,3). The protein contains an amino-terminal CARD domain, a central CED-4 homology domain, and multiple WD-40 repeats at the carboxy-terminus. Several isoforms of Apaf-1 are expressed through alternative splicing generating a small insert following the CARD domain as well as an extra WD-40 repeat (4). Apaf-1 knock-out mice display widespread defects in apoptosis and resistance to a variety of apoptotic stimuli (5,6). Zou, H. et al. (1997) Cell 90, 405-13. Saleh, A. et al. (1999) J Biol Chem 274, 17941-5. Benedict, M.A. et al. (2000) J Biol Chem 275, 8461-8. Cecconi, F. et al. (1998) Cell 94, 727-37. Yoshida, H. et al. (1998) Cell 94, 739-50.